Youth-based counterculture films from Hungary might not be a category familiar to too many film buffs, but Second Run intends to correct that situation with The Confrontation (Fényes szelek), a director better known for his earlier black and white masterpieces like The Round-Up and The Red and the White (not to mention the taboo-breaking '70s stunner Private V ices, Public Pleasures, a film that still hasn't gotten its full due). Here he uses a student protest in 1947 as a not-terribly-subtle parallel to the similar uprisings among the college set occurring across Europe (with similar but differently-motivated ones occurring in America). 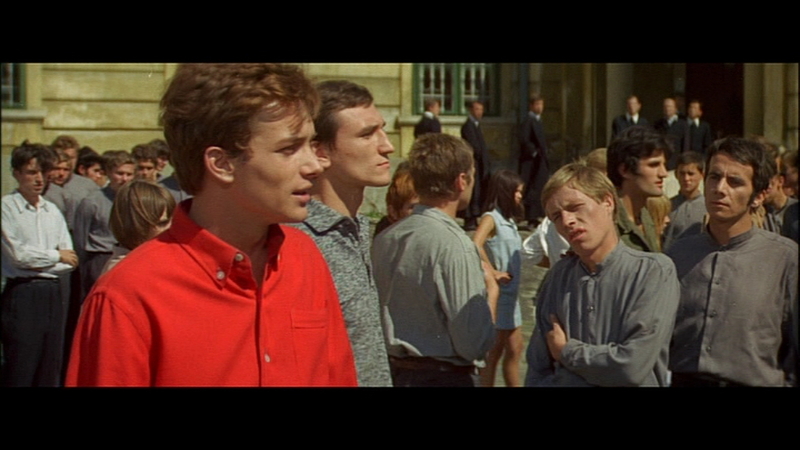 As usual, Jancsó focuses on a very particular time and place to have his characters reveal a more universal truth, in this case with student Laci Feteke (Balázsovits), wearing a blazing crimson shirt for the duration of the film, rounding up his classmates at a Hungarian Catholic School for a Communist protest in which the days are filled with arm-in-arm demonstrations, folk singing, and slogan chanting. The police, party members, and regular citizens interact throughout the day as the dominance among the students shifts back and forth, leading to a bit of a breakthrough at the end as well as a notable change of scenery. 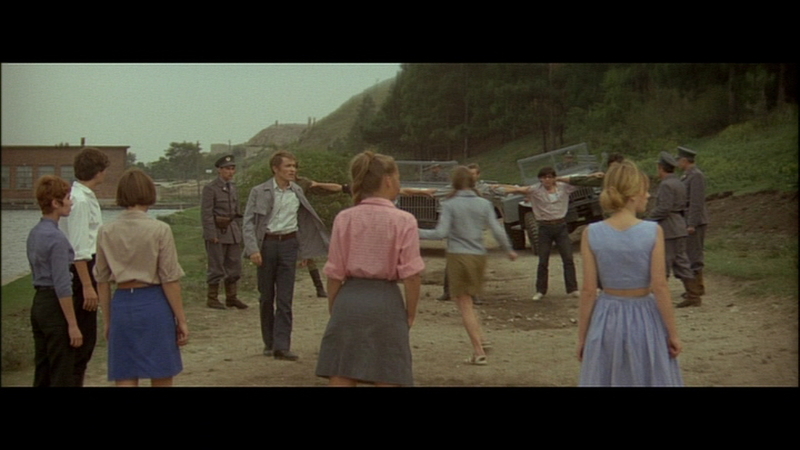 A former Stalinist sympathizer himself, Jancsó explores the ideas of political control and the dangers of extremism here within a very good-looking film, shot almost entirely in medium and wide shots with the actors filling the entire horizon of the scope frame. Most interesting amo ng the characters is Jutka (Drahota), the most extreme member of the bunch who attempts a power grab of her own; however, almost every student gets an interesting little character grace note during the very brief running time, which also makes way for some striking tableaux (the most arresting one involving a whole lot of books). The end result is perhaps a few degrees slighter than some of the other Jancsó films under the Second Run banner (which, in addition to the ones mentioned above, also include Red Psalm and My Way Home), but it's a fascinating film and a worthy addition to a body of work finally gaining more English-friendly exposure on home video. Second Run's DVD apparently marks The Confrontation's first English-subtitled appearance anywhere on DVD, and the results are up to their usual solid standards. 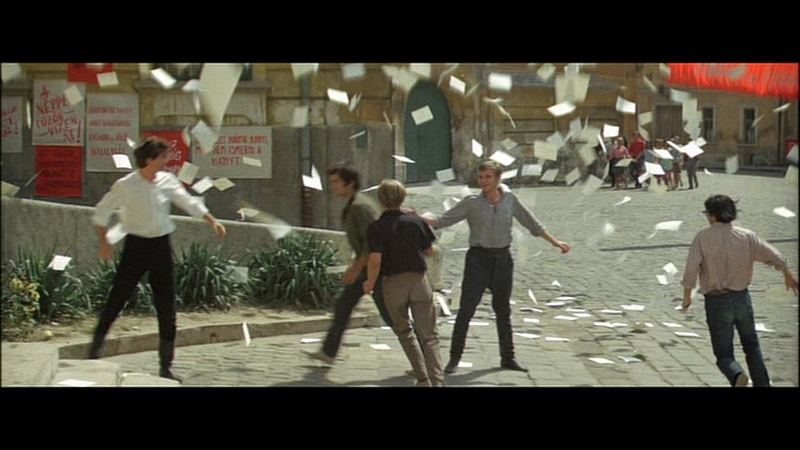 The transfer looks very good throughout, perhaps not as intense as some of the more lavish Technicolor films being made at the time but with the director's finely-tuned sense of color symbolism still coming through nice and strong. The newly-translated, optional subtitles are excellent, and the mono audio sounds fine, especially during the unexpected semi-musical numbers. The disc itself is bare bones, but there's an excellent insert booklet with a lengthy essay from film writer Graham Petrie (who previously wrote about Red Psalm along with directors like Tarkovsky and Truffaut) covering the director's career and the significance of this one, his first in color, both within the larger tapestry of his films and in the political climate of the time. Reviewed on February 16, 2013.